Features a digital signal processor for a clearer high-definition image that enhances fish targets in shallow and deep depths. 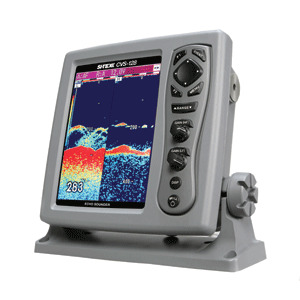 Brilliant 8.4" color LCD daylight viewable display with 8, 16 or 64 color levels, Dual-frequency 50/200 kHz operation, 1000 Watts with 8 ranges from 0-3600 and exclusive Sona-Tone identifies whats under boat with different sounds for fish or schools of fish. Stores up to 10 screen images in built-in memory for recall later. High-speed pulse rate transmission of 5000 times per minute for enhanced shallow water detection.